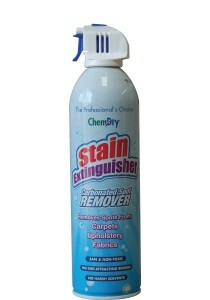 Chem-Dry’s Stain Extinguisher quickly and thoroughly removes stubborn spots from carpets, fabrics and upholstery. It uses Chem-Dry’s powerful carbonating process to lift spots to the surface where they can be swept away with a clean white towel. 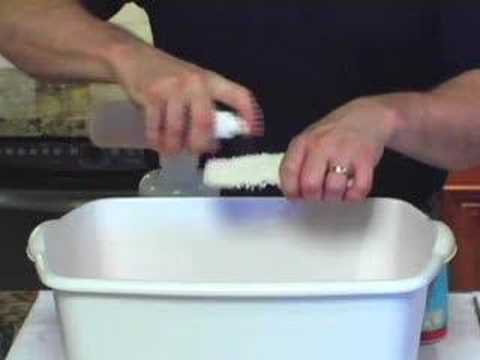 Stain Extinguisher can even be used as a pre-wash spotter for tough laundry stains. Professional Strength Spot Remover is an effective carpet stain removal solution which is able to tackle most water based stains and some light oil based stains. This product can be used on stained carpets, upholstery and fabrics and uses the same crystal clear carbonating carpet & upholstery cleaning process. Carpet Spot Remover | Our Carpet Spot Removal Product Removes Stubborn Stains | Spot Remover From Chem-Dry Tackles Your Carpet StainsAs a carbonated spot stain remover, it is 30% stronger than our Stain Extinguisher carpet stain remover. This unique Chem-Dry product is available in 2 sizes, a larger 20 oz (570 ml) can or alternatively in a smaller 5oz can. This product has a spray nozzle to ensure users can direct the jet at the source of the carpet stain or upholstery stain. For stain removal advice, why not visit our carpet cleaning tips page. Professional Strength Spot Remover is a certified spot stain remover under the Carpet & Rug Institute’s ‘Seal of Approval’ accreditation. It is also accredited under Chem-Dry’s Green Certified Programme, therefore it is safe for humans and animals. Grease & Oil Remover is a dedicated product for removing almost all oil based stains such as adhesives, crayon, grease, lipstick, mascara, make-up, oil and tar from your carpets and fabrics. Oil and grease on your carpets and fabrics can be tricky to address and effective remove. Due to their chemical formulation, grease and oil based stains have to handled differently, therefore it is unlikely a general purpose stain removal product to provide effective result for you. Unlike other solvent-based-spotters, Grease & Oil Remover is water based and non-toxic and is 100% evaporative and residue free. Our Grease & Oil stain removal product is available in 12oz handy cans. Chem- Dry’s Dust Mite Anti-Allergen is a water based anti-allergen solution containing powerful active ingredients. This fabulous product is effective at neutralising the household dust mite allergens that cause allergic reactions and respiratory discomfort. Laboratory studies show that when dust mite droppings are treated with the main active ingredient in the Chem-Dry Dust Mite Anti-Allergen formula, the allergens are neutralised and physically changed. The best way to fight allergies is to eliminate their source. Chem-Dry’s Dust Mite Anti-Allergen is derived from naturally occuring extracts found in plants and trees. It is suitable for use on carpets, bedding, matresses and all household furnishings. It is not harmful to humans and animals. Don’t suffer in silence, let the professional’s help you create that clean breathing zone and improve your indoor air quality. If you are interested in purchasing any of these Professional Home Care Products, please contact your local Chem-Dry representative. Chem-Dry’s Fabric Protector provides an invisible barrier to help you protect against spills and stains. This water repellent product helps prevent spills penetrating fabrics, allowing you to easily clean up with a white cloth or towel. 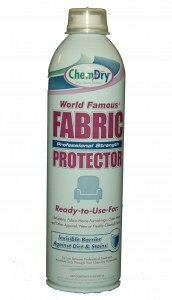 Fabric Protector can be applied to upholstery and fabrics to keep them looking pristine. Don’t pay those high prices to protect your new suite….do it yourself! It’s easy with Chem-Dry Fabric Protector. Our deodorisers keep your carpet smelling as good as it looks. It covers up smoke, cooking, pet, and other offensive odors found in homes or vehicles. It even protects your carpets. And there are no gritty or abrasive powders to vacuum. Special Polymers in the fragrances attatch to your carpet fibres to create a pleasent-smelling, soil-resistant coating, so every time you step on the carpet, the polymer breaks down and more fragrance is released. Chem-Dry Carpet Deoderisers are concentrated fragrances and one can treat up to five times more surface area than conventional powder deoderisers. These formulations are liquids, so there are no dusty, abrasive powders left behind to harm your carpet or attract dirt. Chem-Dry Carpet Deoderisers are available in 14oz cans. Chem-Dry Pet Odour Remover is a must for any pet lover. When you see that fresh little “accident,” simply apply Pet Odour Remover to the area and the unpleasant smells will be quickly neutralized. Don’t trust those home remedies or pet store concoctions, go with what the pro’s recommend. For use between professional Chem-Dry cleanings. Note: Large, older pet stains will require a specialised treatment application of P.U.R.T from your Chem-Dry professional. 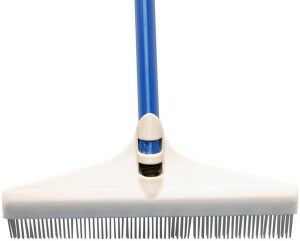 Keep the spring in your carpets with a simple to use carpet rake. Regular use reduces pile-matting in doorways and foot wells and a weekly ‘rake’ before vacuuming helps loosen dirt and grime, making vacuuming more effective. This proves the ideal tool to keep your carpets well groomed. The Razor is the latest innovation from Chem-Dry and is ideal for cleaning hard floor surfaces and removing spots on carpets. The Razor uses a specially formulated cleaning solution and disposable absorbent cleaning pads in one versatile tool. The Razor is easy to use and proves an ideal cleaning tool for any household.